We took the traditional IPA, originally shipped from England to India in the 1700′s, and made it bolder and more flavorful—American Style. We added new varieties of highly aromatic American hops to create a distinctive bitterness profile and an incredible hop character. 3.5 A: Nearly clear golden yellow/light orange color. One finger of creamy white head with pitiful retention, but some splotchy lacing. 4.0 S: Really pungent hops. Something almost musty. Simple, but pleasant. Malts don't really show up to the party. 4.0 T: Moderate bitterness. Earthy and herbal hops are the showcase. Again, malts really don't do much, just a neutral barebones base and that's okay because it works well. Otherwise, very clean. Alcohol isn't noticeable at all. 4.0 M: Lighter medium body. Good moderate carbonation. Super smooth throughout. Moderately creamy. 4.5 D: Simple, clean, and super smooth. Not the most exciting drink, but it's a nice, moderate alcohol brew. Again Odell shows me that simple works just as well as big and complex. I love this IPA. While not the most inventive or exciting, it essentially does no wrong as straight-up American IPA. Sessionable, bodied, sneaky abv, raw piney and juicy floral bursts, clean and dry brown-tinged golden grain textures, flashy and effective effervescence, lean and smoothly crisp tapering as each sip finishes—Odell really just hits all the marks with its IPA. I first tried this three years ago at 77 Longbranch Saloon in Chadron, NE, and it was a revelation on simple, sublime execution; each time I'm able to snag a six, those initial impressions are confirmed anew. The marketing is straightforward, they took the IPA style and made it bolder or American-style, and at 7.0 percent it's nearing the border of Double IPAs but not quite there. Clear weathered golden color, bright clarity and excellent head retention from the two-fingered head that crowns the top of this brew. Big time citric hop aroma and tangerine and clementine juice, with mint and herbs in the back of the nose. Impeccable smoothness from a deep, underlying carbonation that is most likely being slowed by a ton of hop oil. Medium body. So much hop flavor to go around, thankfully the bitterness does not kill the taste buds. Orange zest and spearmint come to mind. Sure the malt is there, a solid biscuity and slightly sweet foundation that is covered with hop flavor. Slightly dry and bitter finish with a faint earthy, herbal flavor. Odell Brewing does a superb job brewing this beer, this one gives most West Coast IPAs a run for their hops. A must try for any hophead out there. Fresh hops and an expert hand yields a piney brew with all the great fresh hoppy notes you want in an IPA without all the unwanted aftertaste that a lot of the time comes with an IPA. The label artwork is pretty neat also, very appreciative of breweries that put effort into proper advertisement of their brand. Would drink again 10/10 times. Bought this beer on a lark. Had never heard of it. A nice pour, a darkish yellow. Okay smell, no real promise of given. Taste is hope central, pine, finishes with a not unpleasant but slight sweetness. Not nearly my favorite IPA but I do enjoy it. I am sure I will access again. 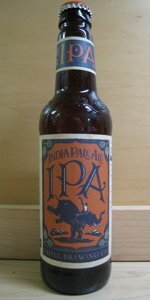 This is the IPA I return to time and time again. It's is so balanced with grapefruit, malt, and hops that it's hard to believe how smooth it is without coming across weak in flavor. No other IPA strikes this kind of balance. If you have it in your area, definitely check it out. Pours a light coppery golden with a bone froth atop the clear brew. Aroma has a strong piney resinous note similar to Rampant DIPA from their neighbor. The hops pack a wallop but the sweet malt fights back achieving a nice balance. It is amazing how balanced this beer tastes yet the hops sustain a steady bitterness and very flavorful pine throughout the finish. There is a medium carbonation and medium body. Oily and coating hop resins dominate. Overall I like this IPA and would seek it out again. From a 12 ounce bottle, best by 6/15/17, into a tumbler. Hazy color with sediment and carbonation. Very hoppy smelling. It doesn't taste quite a strong as the aroma might suggest. Drinks like an IPA pretty much. Creamy when chewed. Big gulps. I think this beer falls into the average column for me. Thanks to my friend for bringing this one back from Omaha, too! The aroma of this IPA isn't as vibrant as I'd like, but it's within the best-by date according to Odell, so it's fair game. I do get some gentle stone fruits from the hops, as well as a lot of pine. The malt profile brings some gentle caramel notes. As it opens up, the fruitier qualities pop up more vividly. Tasting it also reveals a fruitier flavor than the aroma may have suggested. I get a lot of general apricot juice at first, with a splash of grapefruit mixed in. I'm even getting some lime flavor in spurts! Despite the sweeter initial flavors - and the classically malt-laden middle - it finishes quite dry, astringent even. This goes down so easily, it's kind of crazy. I've heard some good things about this, and I'm happy to report this lives up to the hype. And to think it's so readily available in the Midwest! Good, solid, enjoyable IPA. Better than a lot of examples, but not elite status. This pours with very little head and not much lacing. Smell is fruity, citrus- mostly orange. Taste is just like it smells. Bitterness is spot-on! I love this brew. It's definitely my go-to IPA. Lovely thick head that refuses to dissipate. Thick lacing. Aroma of lemon, sweet, tart lemon head candy, fresh aromatic delicate pine needles (not resiny). Palate of balanced pine, fresh forest, earth, lemon, lime, grapefruit, wheat bread, floral, roses, grassy, slight bitter grass. Pros insanely balanced, intense but not too dominant with one flavor, long finish, easy drinking, warming rich alcohol wreath. Cons cannot taste the 7% alcohol. 100/100. Overall - Yet another excellent US IPA. Extremely well balanced and drinkable... definitely recommended.. Pours a darker golden color with a two finger head. Leaves a really nice lace on the glass. Love the smell on this one. Has a very nice citrus hop smell. Feels light. Feels like a session IPA. An exceptional beer and an exceptional IPA. Nuff said.